Remember the fairy tales featuring scary trolls who lived under bridges? We were terrified of them as children, and many of us still get a strange, subconscious feeling of danger when approaching the underside of a bridge. But there are people all around the world who really do inhabit bridges. 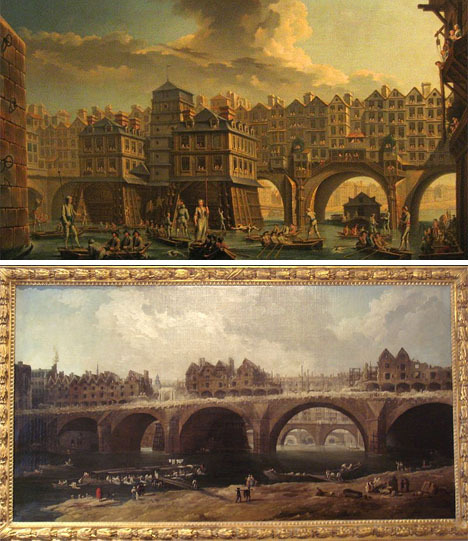 In fact, inhabited bridges were once extremely common in Europe, with France alone boasting some 35 bridges with buildings on them. While they don’t exactly lurk in the dark spaces under bridges, these quirky, unusual homes, shops and cities still bring to mind the magic of fairy tale dwellings. 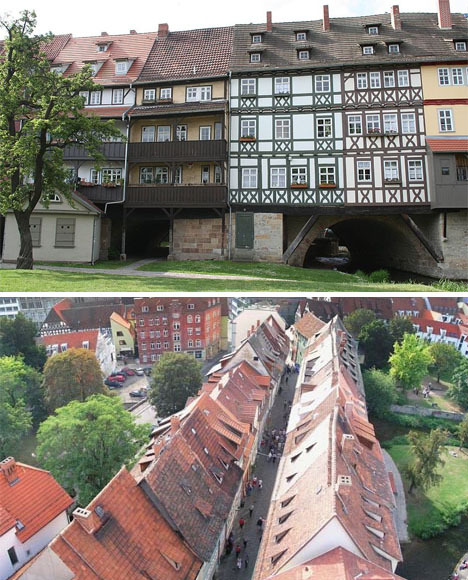 Krämerbrücke, in the German town of Erfurt, is a bridge that has been inhabited continuously for some five centuries. Even before it was covered in houses, it was used as a footbridge and a trading place for grocers. Today, nearly all of the buildings on the bridge are municipal property and used for retail space. The bridge’s long history as an architectural landmark has afforded it special funding for its maintenance and preservation. It has been repaired and reinforced in modern times so that it can now support the weight of cars. The London Bridge hasn’t always been the plan, bland bridge you see in the City today. The first iteration of the bridge was built around 80 C.E., and since then it has been built, destroyed and rebuilt many times. 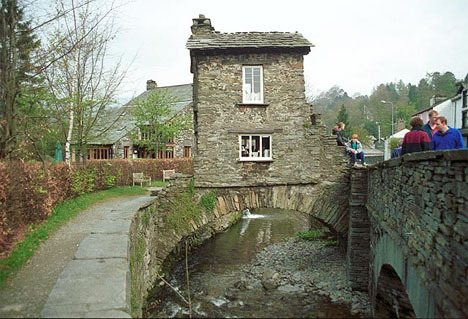 The first version of the bridge that featured houses was built in 1209, and rent paid by the occupants of those houses was used for the upkeep of the bridge. 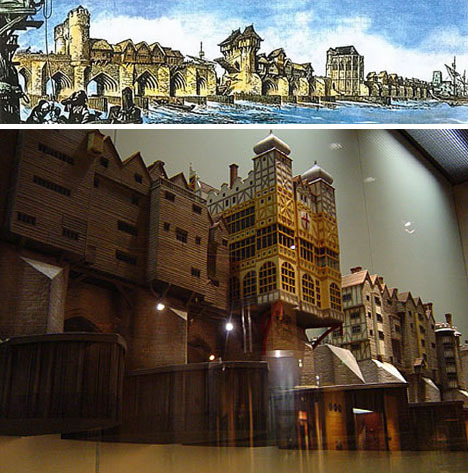 After the Great Fire of 1666, homes on the bridge were rebuilt into modern block homes with roof gardens. But by 1763, all of the houses were demolished. The bridge has since gone under several more reconstructions, but none of them have included houses. If architect London mayor Boris Johnson has anything to say about it, though, future iterations of the London Bridge will again be habitable: he wants to build an £80 million replacement bridge lined with shops, cafes and homes. Literally translated to “old bridge,” Ponte Vecchio spanning the Arno in Florence has an incredibly rich history stretching all the way back to the year 996. Like many other centuries-old bridges, it has been destroyed and rebuilt many times since its original iteration. The current bridge is all stone and is one of the few in the area that still feature shops built along the top. 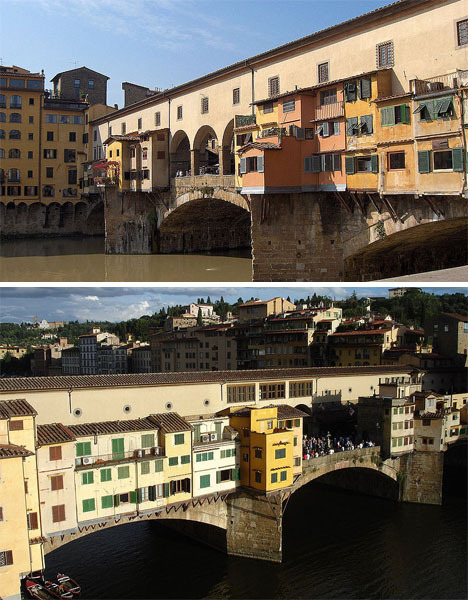 The buildings on top of the Ponte Vecchio have always been dedicated to merchants, and they are still occupied by shops today: mostly art dealers, jewelers and souvenir shops. The bridge was famously spared in WWII following a direct order from Hitler, despite all other bridges in Florence being destroyed. He had spent many pleasant visits to Florence walking along the Corridoio Vasariano and admired the bridge so much that he demanded it remain standing. This quaint two-room house in Cumbria, England was built in the 16th century as an apple store for the nearby orchard. It’s said that the owners built it over Stock Beck to avoid paying land tax for it. Over the centuries, it’s been used as a residence (a family with six children once lived there), a gift shop, a weaver’s workshop, an an information center. Today, it’s a cozy National Trust Shop. Another Italian treasure, the Ponte di Rialto (Rialto Bridge) spans the Grand Canal in Venice and is home to numerous shops. After many collapses and fires, the bridge was rebuilt entirely in stone in 1589-1591. At the time, the architecture of the single-span, double-inclined bridge was said to be so bold as to be foolish, and critics of architect Antonio de Ponte predicted that it would be a disaster. 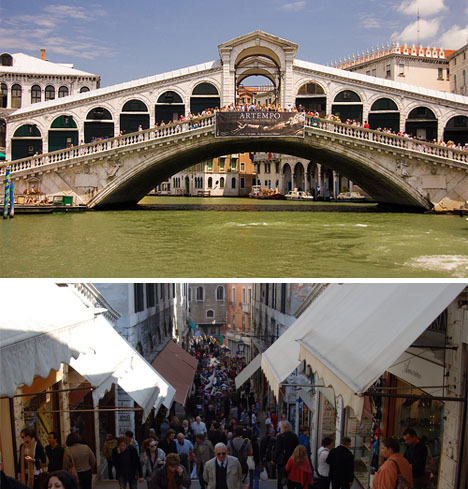 The bridge has stood the test of time, however, and is one of the most popular tourist attractions in Venice. 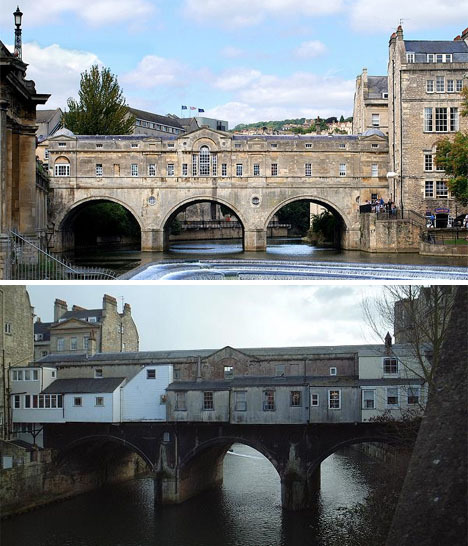 The Pulteney Bridge in Bath, England is considered to be the last habitable bridge built in Britain. It was constructed in 1773 and the architect, Robert Adam, was influenced by both Ponte di Rialto and Ponte Vecchio. Over the years, the bridge was severely damaged, rebuilt, and damaged some more, but in the 20th century the bridge was restored to its original glory. In 2009, an initiative was put forward to ban vehicles from the historic bridge to further preserve it. Said to be the oldest bridge in Paris, the Pont Notre Dame has actually been destroyed and rebuilt in the same location many times. Although it is today a rather plain bridge, it was once lined with 60 grand houses. Charles VI of France ordered the bridge rebuilt in 1412 after it was destroyed by floods in 1406. Following a seven-year construction period, the wooden bridge and its houses, 30 on each side, were finished. They stood grandly until 1499 when the entire bridge collapsed, probably due to the weight of the houses and lack of necessary repairs to the bridge itself. Not to be daunted by the failure of the previous structure, Paris rebuilt the bridge – this time of stone – and the houses atop it. The new bridge and its homes were completed in 1507 and remained until the last of the houses was demolished in 1788, both for sanitary reasons and to preserve the stability of the bridge itself. 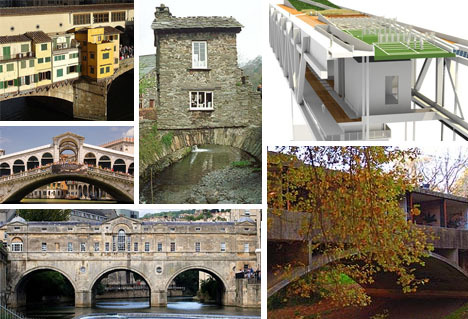 Ancient European cities may have started the trend of inhabited bridges, but modern architects are carrying on the tradition with some very interesting designs. 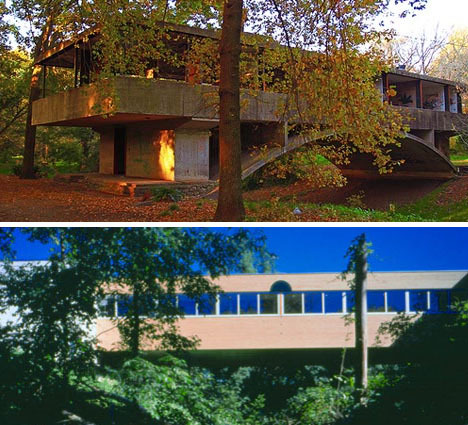 Amancio Williams, a famed Argentine architect, built the above house (top) which is known as Casa del Puente. A bridge in nature as well as in name, Casa del Puente in Mar Del Plata is one of Williams’ best-loved works. Below that is a minimalist modern bridge home in Massena, New York, built by architect Michael P. Johnson and called Sullivan House. It’s what some parts of the country call a “shotgun house,” consisting of one long, narrow stretch with no hallways. The interior is decidedly modern and comfortable, with open spaces and plenty of natural light. What happens to bridges once they live out their useful lives? Some people advocate preserving the old structures and putting them to new use, which they argue will cut down on construction costs and pollution as well as provide a useful new area. One group which has successfully pulled this off is Friends of the High Line, a cooperative which managed to save the High Line elevated train bridges from destruction in New York City. The train overpasses were built in the 1930s to take dangerous freight train traffic off of the streets. The last High Line trains ran in 1980, and for a while it looked like the High Line would be demolished. 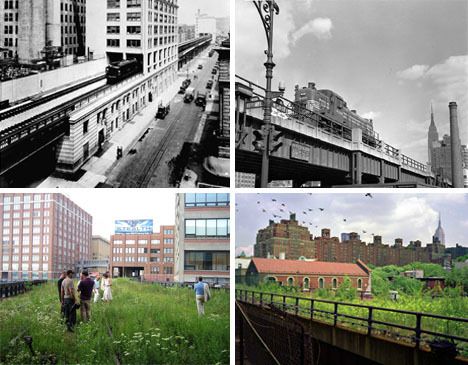 Friends of the High Line was formed to save it, and the group received City funding to turn the elevated train bridges into a high-rise park. The first section of the park opened in 2009 and the second section will open sometime in 2010. California architects Ronald Rael and Virginia San Fratello have proposed a similar solution for the decommissioned section of the Bay Bridge. They argue that the space should be turned into an urban park and outdoor sports attraction rather than demolished at the cost of taxpayers. 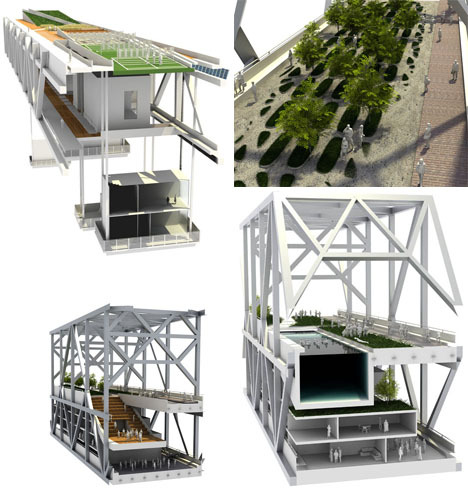 They hope to demonstrate that structures like bridges could be repurposed into urban housing, public parks, and other beneficial projects. The bridges are already incredibly stable, and many of them are simply abandoned until they are eventually destroyed. Rather than wasting that proven stability, they ask, why not make good use of it to build healthier places and healthier people? Whether the initiative will be successful remains to be seen, but the prospect of living, working and playing above water is very attractive for many people.